I’ve been on a macaron baking craze recently so there were close to 5 egg yolks lying in my fridge which made me very uncomfortable because I hate wasting food. 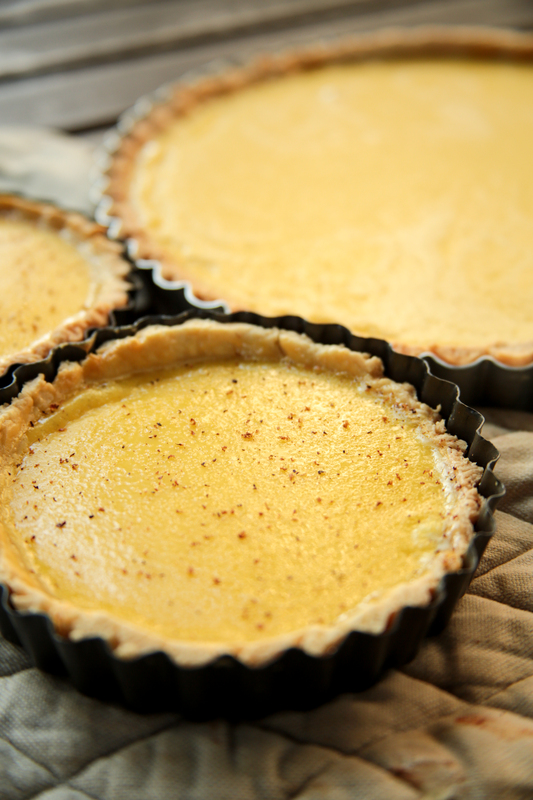 Coincidentally, theboywhobakes Youtube video on egg custard tart was suggested on my Youtube home page and tadah, I figured a way to use up all those eggs. Ironically though, I had to break more eggs and ended up with extra egg whites. Theboywhobakes’ videos are really fun to watch. He makes baking seem so easy that I can’t wait to try his cherry pie next! Even my dad was engrossed with the video and begged me to make the cherry pie. The egg custard tart was a bit too creamy for my liking though. Because I brought it to a party, I got some feedback as well. Some people loved the creaminess but some people didn’t particularly like it. However, I felt that the texture of the custard was spot on, it was neither too solid nor liquid. The tart shell was perfect too, it could be rolled out and placed onto the mould in one piece, something I have never been able to do before especially since Singapore has such hot weather. 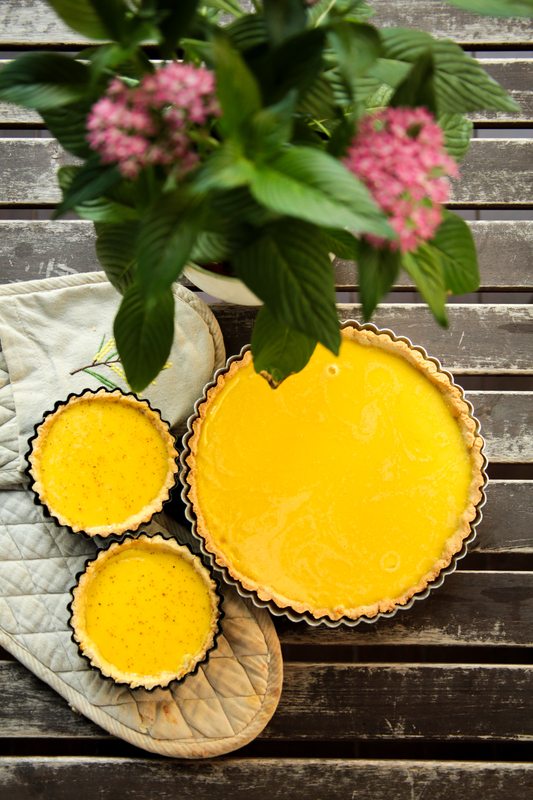 Okay enough rambling, if you ever find yourself needing to use up 8 egg yolks, then you have to make this tart. Otherwise, I’d probably give it a pass. Too much fats hahaha. And ps, don’t ever tell your friends what you put in the tart. They would never ask for seconds. 3. Break an egg, and using a fork, mix the egg into the mixture. 4. Knead using hands until a ball of dough is formed. 6. Once firm, dust the worksurface with a little flour and roll out the pastry until it is about a couple of inches wider than the tart tin. 7. Roll the pastry onto the rolling pin and gently drape it into the tin. Gently lift and press the pastry into the base of the tin, cut off the excess overhanging the tart. 10. Remove the tart from the fridge and line it with a piece of parchment paper, filling it with either baking beans or rice and bake in the preheated oven for about 20 minutes. 11. Remove the tart from the oven and carefully remove the parchment and the baking beans. 12. Place the tart back in the oven for about 5 minutes to brown the base a little. 13. 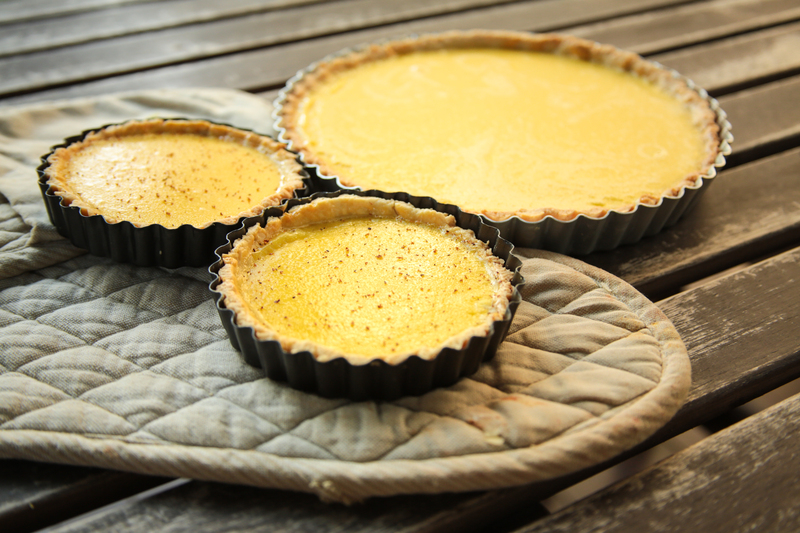 Once the tart has baked, take an extra egg yolk and using a pastry brush coat the entire inside of the tart. 15. Turn the oven down to 130C and make the custard. 16. Place the cream and milk into a medium saucepan and set over medium heat. 17. Add the vanilla extract and bring the cream to a simmer. 18. Place the egg yolks and the sugar into a bowl and whisk together. 19. Pour the hot cream over the yolks, whisking constantly. 20. Leaving the tart in the oven pour in the custard. 21. Grate the nutmeg over the entire tart and then bake for around 30-40 minutes or until set around the outside but still with a little wiggle in the middle.